Last week I challenged my AgProud followers to talk about agriculture with at least three other people they met in their communities. If we are going to be a part of the Agriculture community, sharing our story when opportunity knocks at our door is something we should always be prepared to do. I thought I would share my experiences in hopes that it will inspire you to take this challenge in future weeks. 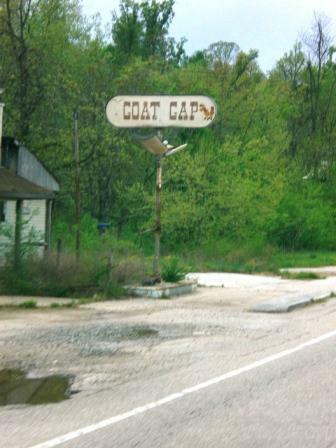 Even if you live somewhere like “Goat Gap” there is someone that would learn from your conversation with them. I had a busy week as I traveled from my home in Arkansas to visit some friends in Fayetteville, then travel to Stillwater, pack up my things in a U-haul, and move to Dalhart, Texas. A little more traveling than many of you may do in a normal week, but is shows the different opportunities there can be to share your story. In Stillwater, I had a fun time looking for a U-haul trailer. (Word of Advice: Never expect there to be moving trailers left in a college town at the end of May. Duh, right? You think I would know better.) I finally found a trailer in Cushing, about 30 miles down the road. I called the lady and asked if she would stay a few extra minutes for me to pick up a trailer. As I waited in her office for my papers to finish, we struck up a conversation about why I was moving. I told her about my new job in the feedyard. She was excited to hear that I had just graduated from the Animal Science department at Oklahoma State, her alma mater, and told me how her and her husband had a few Longhorn cattle. She described how she was indeed a city girl, but loved her kids to have a few cattle at the house. She lit up when she was describing their different horns and the different activities of feeding the cattle and showing them to friends and family when they drove in from Kansas. I asked about all of the different questions people sometimes asked about cattle. You know the ones like “If it has horns it must be a bull” and “All cows with spots are those Dairy cows.” I may not have laid some facts and figures on her, but I have found someone else that is inspired and enthusiastic about sharing her AgProud story. Even if I may not have told her to keep sharing her story, I showed her how easy it is and the good feeling of sharing her story with someone else. My next two examples occurred at the same cook out, but the stark contrast shows just how close to us those who need to hear our story can be. I attended a cookout on Saturday night for the Memorial Day holiday (After two hours of dressing out some calf fries), most in this town have many ties to the feedlots in the area, but some of these young couples did not. I overheard a conversation between this particular girl and one of my roommates over just how “smart” cattle and other animals are. I really did not want to chime in because one side was defending that cattle are not smart at all and only know what we train them to do and the other was that cattle are as smart as humans are when it comes to critical thinking, decision making, and feelings. However, this is exactly the conversation I needed to step in on and offer my opinion. I was asked where I stood on the topic, and I simply said the middle. Yes, cattle are smart. They can make decisions and realize when they learn something new. Take training horses for example: when a horse learns what you are teaching, it shows a response by licking its lips or a change in attitude. (Maybe not the best example, but you get the point). I then went on to explain that cattle are not as smart as humans due to lower brain development. Later in the night, the girl mentioned that her and her husband did not eat much meat (which utterly confused me seeing how we were at a BBQ). I asked why, and her reply was because of all the hormones in the meat today. She did not know that the hormones in implants are very similar to those naturally produced by the body, and are only used to enhance efficiency of the animal’s growth. She was not convinced when the conversation ended, but maybe I left a thought that might spark interest for her to look into things a little more. At the same cookout, I met someone from the Texas and Southwest Cattle Raisers Association (TSCRA). Now you might be asking what good is it to talk with someone who is so involved in advocating the cattle industry. Conversations like this spark many new and great ideas among agvocates. She said working with TSCRA members and producers has given her a great opportunity to learn from both sides of the fence and encourage producers to be more proactive in improving their cattle management. After we had talked for a while, I mentioned something about this blog and my AgProud blog, and she was amazed to find out I was the person behind both. (It is still weird to know that people write these things I post) The conversation continued into how we can encourage producers to tell their own stories and show why they are proud to be a part of Agriculture. We both agreed from our short experiences in the cattle industry that “word of mouth” is a very powerful force when it comes to spreading the news. Why cannot we as cattle producers use this to our advantage and share the great stories we have to tell. You may not have taken much from this, but I hope you realize how easy it is to share the story about your place in Agriculture. Our neighbors, family members, folks at the BBQ, or the person at the U-Haul rental; these are all people who need to hear the great story we have to tell. Will you take the challenge to ask others their opinions of food production and answer their questions? Let me know what kind of responses you receive because I would love to share them with others. CattleFact: Dating back to 1877 the Texas and Southwest Cattle Raisers Association (TSCRA) has been working hard for cattle producers primarily in Texas and Oklahoma in issues of law enforcement , livestock inspection, and legislative and regulatory issues related to cattle production. Their website give detail of the many other services offered to cattle producers in Texas, Oklahoma, and surrounding areas. Next First week in the feedlot!